Think of the body of a String Bass as sections of a Russian nesting doll, and you get the idea of the new travelling bass. 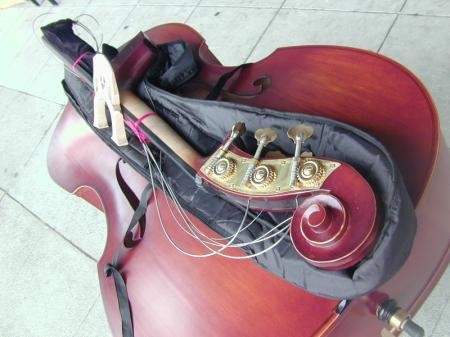 It will not fit into the overhead luggage compartment on an airplane, but Upton Bass has developed a travelling acoustic string bass that nests into a rather (considering the contents) small utility case. Assembles in about 15 minutes. 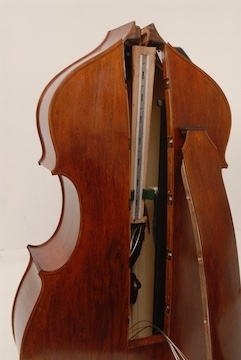 Think of the body of a string bass as sections of a Russian nesting doll, and you get the idea. I don't know if the bow collapses so that it will fit into the case as well (if not, I know how they could do it). There are a few companies that make folding basses. These two, Berkeley and Chadwick, in addition to the Upton Basses. There may be more but I haven't researched it.